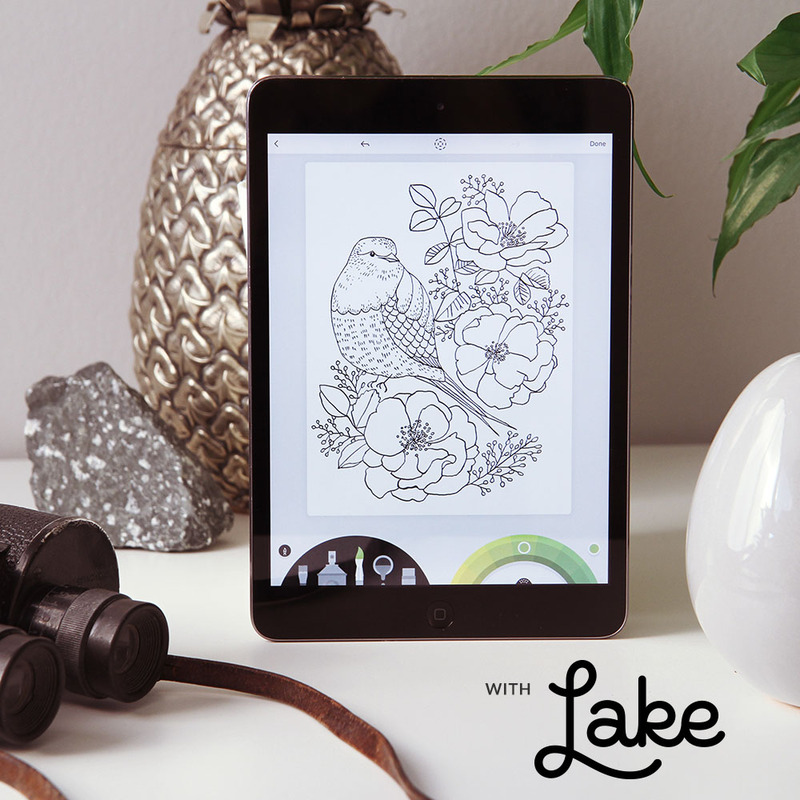 Lake is a coloring app for iPad and iPhone that helps you de-stress through creativity. It comes with an ever-growing collection of coloring books from Instagram popular artists, offered exclusively on Lake. Right now there are 36 artists offering over 500 beautiful drawings, and there is something for everyone’s taste! Each coloring book includes 12 beautiful illustrations, a custom color palette, and endless coloring possibilities. 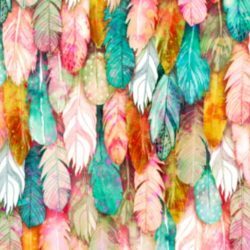 Just as with Spoonflower, when you make a purchase on Lake, you support artists directly! Don’t miss the exclusive (and free!) 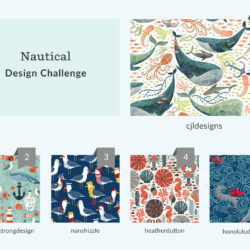 Spoonflower pack featuring the top design challenge entries, coming to Lake August 23, 2018. What’s inside the Spoonflower pack on Lake? The top 8 designs in the Lake & Spoonflower Black and White Coloring Book design challenge, selected by Lake from the popularly voted top 25, will be available in the Spoonflower pack on the Lake app August 23. 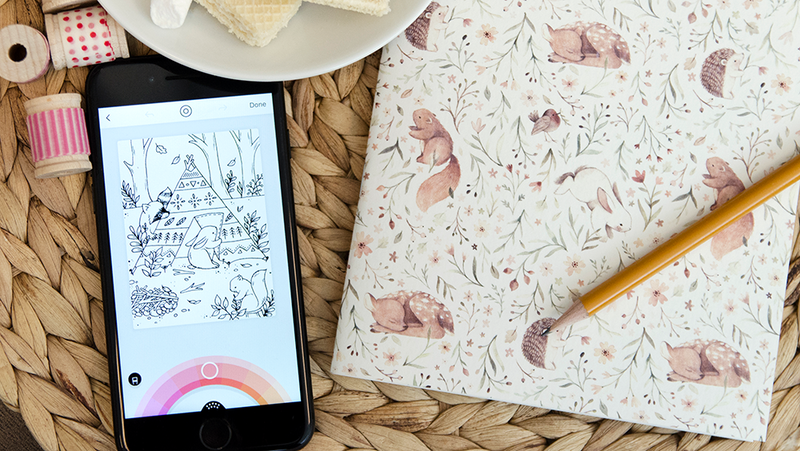 After creating a masterpiece with Lake’s custom coloring tools, colorists will be able to upload their coloring book page (from the Spoonflower pack only) directly to Spoonflower and order on fabric, wallpaper and gift wrap! Designers included in the Spoonflower pack will receive up to 15% designer commission when their design is ordered. How to create a coloring book inspired design! 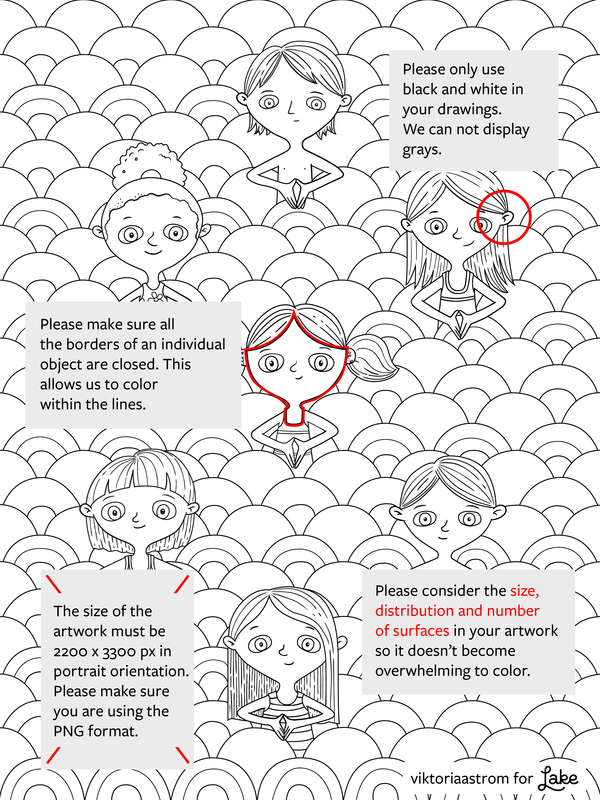 Coloring book designs should only use black lines on a white background. *The Lake team will work with the winning designers to ensure the scale of each design is suitable for the app! One Grand Prize Winner, chosen from the popularly voted top 25 by Lake, will receive $200 in Spoondollars, 1 year Lake subscription (valued at $59.99). 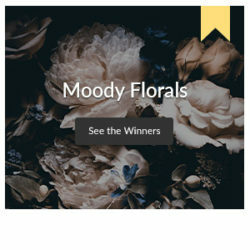 The winner will also receive additional exposure in our email newsletters, professional photography of their printed designs, and social media mentions. The 2nd place winner, chosen from the popularly voted top 25 by Lake, will receive $100 in Spoondollars and 1 year Lake subscription (valued at $59.99). The 3rd place winner, chosen from the popularly voted top 25 by Lake, will receive $50 in Spoondollars and 1 year Lake subscription (valued at $59.99). 4th through 10th place winners, chosen from the popularly voted top 25 by Lake, will receive $20 in Spoondollars and 1 month Lake subscription (valued at $7.99). Each of the top 25 entries, determined as set forth above, not receiving one of the forementioned prizes will be automatically proofed for sale in the Spoonflower Marketplace (approximately a $5 value) (the “Runner Up Prize”) if winners are verified sellers. *If a colorist chooses to purchase their finished coloring book page on Spoonflower products, the original designer will receive up to 15% commission. 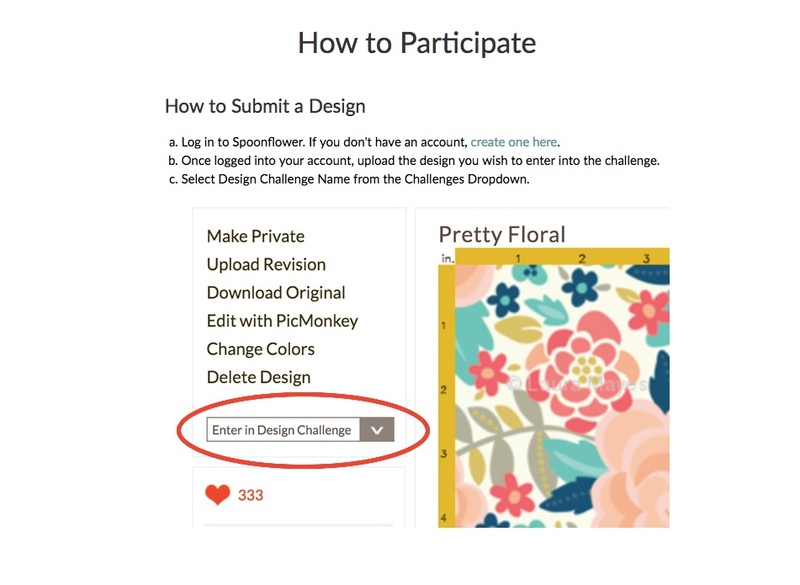 Only the original designer (top 10 winner) will be able to make the design available for sale in their Spoonflower shop. Colorist uploaded versions will not be eligible for the Marketplace and will not receive a 10% designer discount. Hi Gracie! 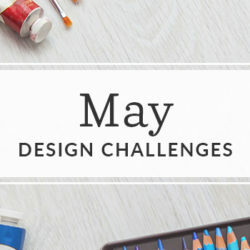 To learn more about our weekly design challenges, please click here! This sounds great! Could you clarify if the design needs to be a repeat tile or just a placement image? I’m asking because you say that the pages be able to be uploaded to print on fabric, wallpaper and gift wrap, but it’s not clear. Thank you! Great question! Entries will be previewed at the fat quarter size, 21″ x 18″, and should be a repeating pattern. Lake will work directly with the winners to ensure their design is suitable for their app! Submissions ask for 2:3 portrait format but the display box for the comp is in landscape so designs do not display well! The suggested repeat size for a coloring book design is 14.6” x 22” (2200 x 3300 pixels) and designs will be previewed on a fat quarter (21″ x 18″). If you’re concerned with your design displaying correctly for voting, you can make your design smaller. Lake will be working with the winners to ensure their design displays correctly for their app! I’ve made the design smaller, much smaller, it still displays exactly the same in the competition entry view box with the top part cut off! I used 2200×3300 pixels in the original. The designs for this one really should be displayed in a box with ratio of 2:3. Try it yourself, upload a 2:3 image make it as small as you like and the top and bottom still get chopped off! Thanks for your feedback! At this time we’re unable to adjust the preview for this challenge but you can update the scale of your entry by selecting the “edit entry” option in the drop-down menu. Why is this not available on Android platform? Hi there! Can we use words in our designs? You can include words in your designs. Will the voting public be viewing the designs in portrait or landscape? Also, does Lake use just a portrait layout or do they also use landscape? Designs for this challenge will be previewed as a 21″ x 18″ fat quarter. Lake features portrait designs but you are not required to submit a vertical design. Lake will work directly with the winners to ensure their design is suitable for their app. I keep trying to upload my work. I have done it exactly to the measurements specified, but once uploaded on the preview screen it is completely cut off. I have tried making the image a lot smaller (as you previously suggested in an above comment) but it does not change the preview image. Are you adjusting the entries to be properly visible for voting? We’re so sorry for the trouble! While we won’t be adjusting design entries, please send our support team an email at help@spoonflower.com for additional assistance! When you change the dpi you have to ‘save this layout” . I hope you got help from Spoonflower for this.